Hardcover, 72 pages, 21.0 x 27.0 cm, 8.3 x 10.6 in. 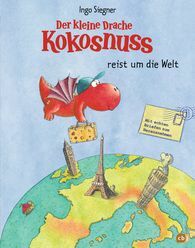 The exciting journey round the world of Coconut, the little dragon – with real letters! Coconut, the little dragon, is horrified: that nasty Murky has abducted his friend Oscar! The two of them have disappeared without a trace. Without a trace? No, luckily not quite. Oscar was able to leave a letter behind containing valuable clues, and this takes Coconut straight to – London! The city of people who carry umbrellas and drink tea is huge, but Murky has long since moved on. Oscar's letter takes Coconut first to the Eiffel Tower in Paris, then to Pisa, where leaning towers are popular, and then finally right to the middle of China. Will Coconut manage to rescue Oscar? We are told all about this, and a whole lot more besides, in this new, exciting adventure of Coconut's journey round the world.